Sacraments at St. Elizabeth Ann Seton Church are joyful community events for which we carefully prepare. Parish staff is available to discuss sacramental preparation and parish procedures. 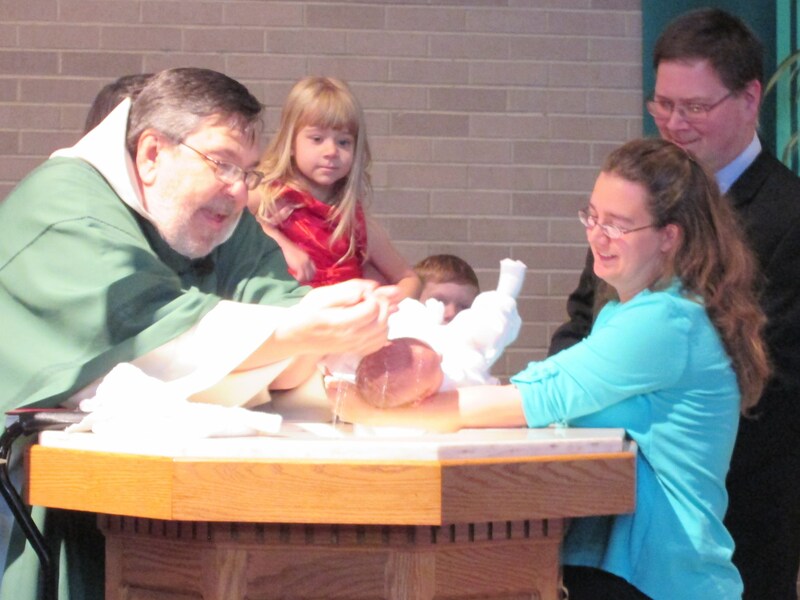 BAPTISM – Registration and Baptismal Prep must be done through Deacon Jeff Cieslewicz. Contact him a jcieslewicz@dioceseofgreensburg.org or by calling the parish office at 724-864-6364 and leave a message for him. Baptismal Preparation MUST be attended if the baby is the 1st child of the couple. Click here for the Baptismal Information form: Baptismal information form . The completed form must be either emailed or printed and given to Deacon Jeff at the Parish office. This form must be received 2 weeks prior to the scheduled Baptismal date. RCIA – If you or someone in your family has thought about entering the Catholic Faith, the RCIA program is the route. Unbaptized adults and children (aged seven to seventeen) are prepared for the sacrament through the Rite of Christian Initiation of Adults (RCIA) or Rite of Christian Initiation of Children (RCIC). Those interested in learning more about the Catholic Faith are encouraged to the parish office at 724-864-6364. Sponsor Certificates for Baptism and Confirmation: Anyone needing a sponsor certificate to be a godparent or confirmation sponsor must be registered in the parish for at least 6 months, attend Mass regularly and support the church, have all of their sacraments, and if married, it must be a Catholic marriage. EUCHARIST – The Eucharist is the source and summit of our faith. Through it we receive the Body and Blood of Christ, who suffered and died for our sings, and rose again in glory on Easter. The Eucharist is available at every Mass. In addition, those who are unable to attend Mass due to an illness or physical affliction can request through the parish office (724-864-6364) to have Holy Communion brought to them. Preparation for First Eucharist is separate from and in addition to Religious Formation classes. Contact Deacon Jeff or Jen Henry, Admin Religious Formation Intern at the Parish office for more information. CONFESSION – Children normally receive first Reconciliation and first Eucharist in second grade. For further information, please contact the Parish office. Confessions for all others are held on Saturday mornings at 11:00 am in Church. Communal reconciliation services are scheduled in the Advent and Lenten seasons. Watch the bulletin and website for dates. CONFIRMATION – Youth are confirmed according to the schedule from the Diocese. For more information, contact the Parish Office. Adults are confirmed at the Easter Vigil in accordance with the RCIA process. For more information about RCIA, contact the Parish Office. WEDDINGS: To adequately prepare for this great sacrament that symbolizes the love of Christ for his Church, those wishing to be married are to make arrangements at least 1 year in advance. The time for Saturday weddings is 1:00 pm. Contact the parish office for more information. ANNOINTING OF THE SICK: Held after weekday morning Mass on the 1st Weds of each month, all of those sick or advancing in years are welcome to receive this important sacrament. Please contact the office if a member of your family is gravely ill and needs to be anointed. We would like to visit them in the hospital or at home and bring Holy Communion. Someone with serious illness, physical, mental or spiritual should be anointed. This sacrament is for the sick, not just for the dying. HOLY ORDERS: Men who may be called to a vocation to the priesthood or diaconate should contact the Greensburg Diocese office at 724-837-0901.